"My Penthouse Paradise" Superb Winter Lodging! 2 Pools! Parks! "WOW!” check out “My Penthouse Paradise”! This may be the nicest one bedroom in the Bonita Beach area! Prepare to “Experience the Fun" of Bonita Village! Our casual upscale living offers a unique vacation destination in a relaxed community. The best part is Bonita Village is close to everything! You can be at the water’s edge of the Gulf of Mexico in as little as 180 seconds, or be shopping at Coconut Point Mall, South Florida’s largest new mall, in 10 minutes. If you are a golfer, be sure to ask us about FREE ACCESS TO 35 AREA GOLF COURSES plus discounted green fees until Oct. 31st! Boaters are only 60 seconds away from a great time on the water! To book your stay 'Just Call Pat' at 239-707-9163. Upon arrival the gorgeous Beach Entry Resort Pool and Waterfall will be all yours. Our flower covered Island and poolside Chickee, affectionately named, The Groggy Frog, will become part of your vacation life as you enjoy 2 TV's and tasty casual food and cold beverages. Its thatched roof provides a shady break from the toasty sun and is a great place to meet our residents and make new friends. Also, for your enjoyment are two large Spas, and the exciting Island Clubhouse with a marvelous Cybex Gym, Internet Café, Billiards Room, plus Game, Media and Social Rooms. This residence’s tropical interior brings the community’s Caribbean atmosphere inside. The main living areas and lanai feature porcelain tile floors, granite kitchen counters, and crown molded volume ceilings. In addition, the top floor lanai will provide special morning sun and preferred afternoon shade, plus hours of enjoyment from the Bird’s Eye view of the Water Garden and “Quiet Pool”. It doesn’t take long to become used the serenity this luxurious home offers. The living room is light and bright with new electronics that feature a BIG SCREEN TV and DVD. The marvelous Master Suite with a King bed has another convenient Flat Screen TV with DVD. The Master Bath has a huge dual vanity, spacious shower, private water closet and Roman Tub! For computer access, bring your laptop and use the High-speed Wireless Wi-Fi Internet is offered at the Internet Café in the Island House. 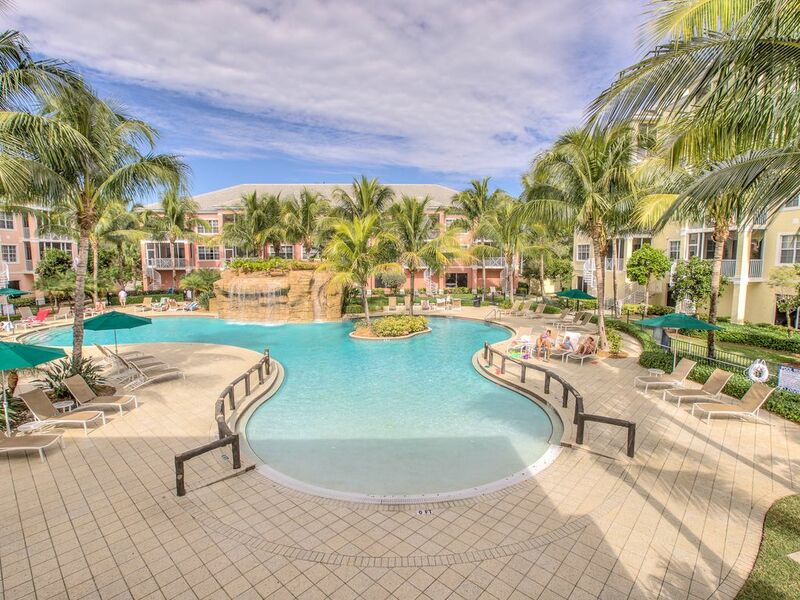 There is something for everyone at Bonita Village; whether working out at the Fitness Center, playing billiards, making friends around the Pools, or even riding the Free Private Beach Shuttle to shell-ladened Bonita Beach! The "Quiet Pool" provides a get-away to immerse yourself in that new novel. For a delightful evening out sample one of the 20 plus specialty restaurants close by. If you enjoy the arts you may prefer an evening at the Philharmonic, or step it up a notch by visiting bustling Fifth Avenue in downtown Naples. A host of outdoor sports and activities available and only a stone's throw away. Quick and convenient access to this fabulous destination is available from the Regional Southwest Airport (RSW) which is only 25 minutes away. Call or email us with your questions but be sure to book your vacation soon as one bedroom residences are limited! Preferred weeks and months went fast last year. Take action now and prepare to "Experience the Fun" in the amenity rich resort-style condominium of Bonita Village! You will not be disappointed! For quick answers to your questions 'Just Call Pat' at (239) 707-9163. You will cherish your experiences, fun, and lifestyle The Sunshine Palace offers! We have been coming to the Bonita Beach area for years. Boating, beaches, and water sports are the highlight of our trips. We are happy to be able to share this quaint "Penthouse Paradise" with all who enjoy the sun and fun this delightful area offers. Our previous experiences in the area made our choice easy when we were looking for the right investment. The huge Resort Pool and quick access to the beaches will delight you. The amenities here are fantastic and provide something for everyone. Our residences is the largest one bedroom we have seen in the area and the extra bath provides us with plenty of "get ready space" when we are going out. You will like the layout and view! 3 minute drive to the Gulf of Mexico. Located in the Clubhouse called the Island House. TV and Internet Service is provided by CenturyLink. Beautiful condo.....immaculate...... loved the pool! Thank you for staying with us and being excellent guest! We love referrals! Refundable security deposit depends on the length of the stay.